Oh, how I adore these tacos. 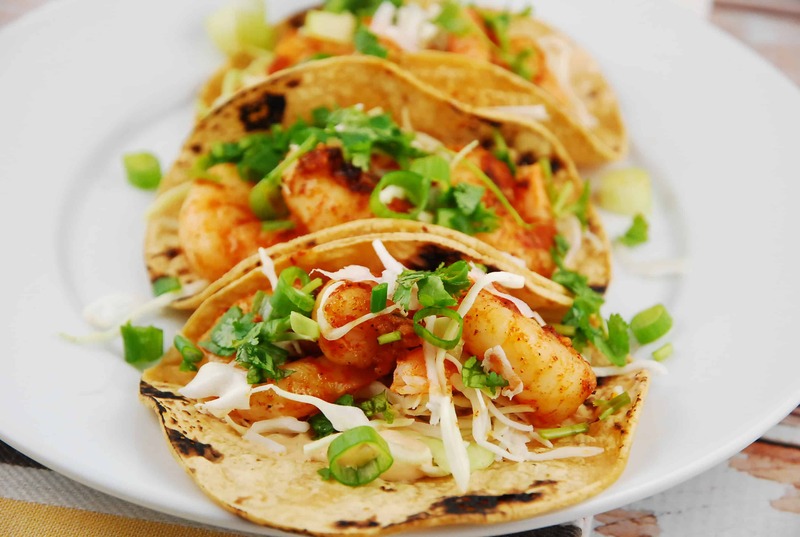 This quick and easy Chipotle Shrimp Tacos Recipe is not only a perfect weeknight dinner recipe that can be prepared in a pinch, they are incredibly delicious. The rich, smoky chipotle cream sauce is the star of this dish. The number of chipotles in adobo sauce will affect how spicy these are, so if you can’t take too much heat, stick with just 1 tbsp. However, if you can handle spicy, then add as much as you’d like. I actually doubled the recipe so that I could have some for lunch the next day. One thing to pay attention to is the tortilla size. The ones I used in this recipe were the “slider” size. If you use a larger tortilla, it may add an extra Point. Serve with black beans and roasted corn on the cob or other roasted veggies for a complete meal. Enjoy! A wonderful balance of sweet and spicy makes these tacos a hit. Quick and easy to cook, tons of flavor, and just 4 Smart Points each. In a large bowl, toss together the shrimp, olive oil, lime juice, garlic, smoked paprika, chipotle chili powder, and salt & pepper. Make sauce by whisking together there mayonnaise, sour cream, and chipotles. Set aside. Heat large skillet over medium high heat, and mist with non-fat cooking spray. Add in shrimp, and cook until no longer pink, and slightly browned. Spread about 1/2 tbsp of sauce onto each tortilla. Top each tortilla with equal amounts of shrimp, cabbage, cilantro and onions. Yum! I mixed the sauce in with the cabbage to make sort of a coleslaw for the topping. And I used a ton of cilantro because I always do. Finally, of course, I warmed/blackened the tortillas over flame. Only 4 points a taco…amazing. Tacos are life. Thanks for a great, trackable recipe! Perfect recipe. Very flavorful sauce and filling! I added a tsp of dill to the mix. Yummy!